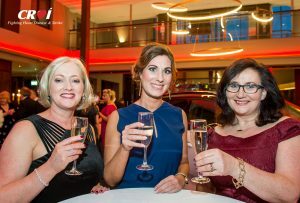 We’re rolling out the red carpet to welcome you to a wonderful night of great food, drinks and entertainment in support of Croí, the Heart & Stroke Charity. 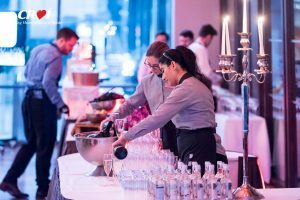 Join us at The Galmont Hotel, Galway on Friday, March 22 from 7pm for a cocktail reception followed by a three-course dinner and a special performance by one of Ireland’s top actors and comedians. Then dance until late with the incredible 90’s tribute band, Smash Hits! And a comedy performance by one of Ireland's top actors and comedians! 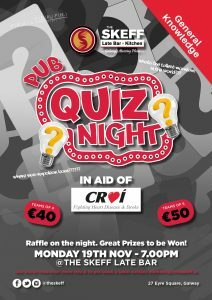 Join us at The Skeff for a night of Trivia in aid of Croí. The London Marathon is a long-distance running event held in London, United Kingdom, part of the World Marathon Majors. The event was first run on 29 March 1981 and has been held in the spring of every year since. We can offer you a guaranteed entry as part of our tour package, regardless of your previous marathon times (if any). You just need to be resident on the island of Ireland and be at least 18 years old on marathon day. With almost one million spectators and a carnival atmosphere, the London Marathon is an unforgettable experience. Update – As of November 7, 2018, €13,641.75 has been raised! Thank you to everyone who supported Martin and Linda’s event for Croí. You can still donate to this fundraising event! 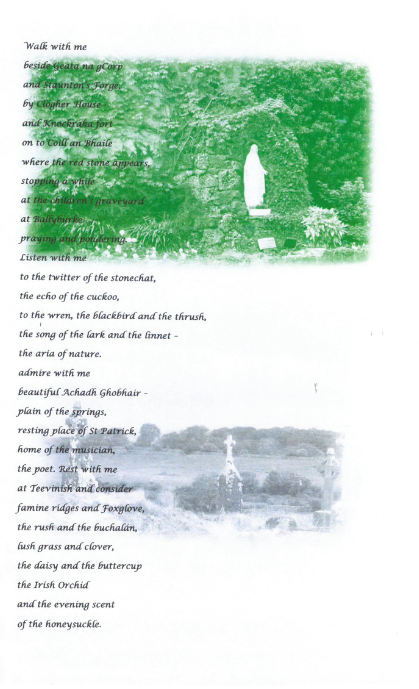 Donate directly to Croí (Ref: 32forCroí) or contact Martin or Linda. 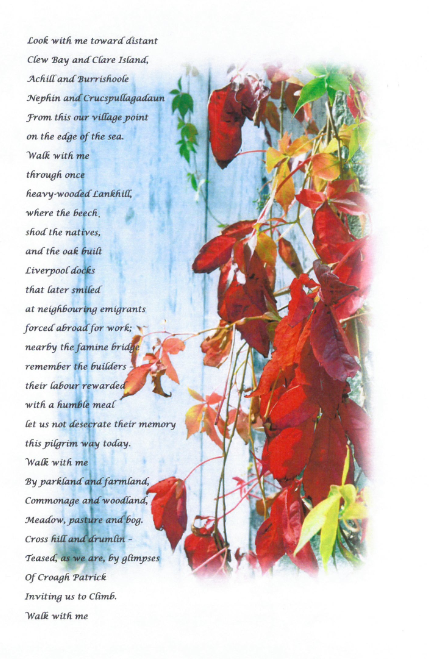 For updated and more information, go to the 32forCroi Facebook page. Well known car enthusiast and rally driver Martin Ward, will reach the ripe age of 70 at the beginning of October. 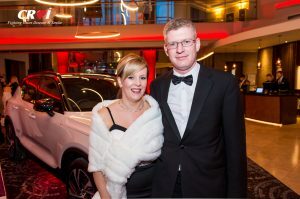 To celebrate Martin and his wife (and long-time co-pilot in their rallying days), Linda Conroy, are taking on a unique challenge, as they will visit the capital towns/cities of the 32 counties of Ireland in 32 hours in a 32-year-old car, so therefore it’s been called ‘32 for Croi’. 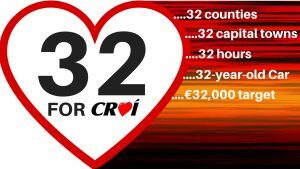 For many years during their rallying career, Martin and Linda flew the flag for Croi and carried out other fundraising for the cause; as with so many others, Martin’s family has a history of heart disease and he has lost a number of siblings and relations to sudden heart failure. He himself has had two heart attacks, so this is the reason this charity holds a special place for him. Martin and Linda will take to the road in their 32-year-old Mercedes 190E Cosworth, which has just been recommissioned after being off the road for almost sixteen years. They will be holding a launch night at the Meadow Court Hotel on Friday 28th September. Follow their Facebook event page for further updates. Listen to Martin and Linda’s interview with Radio Kerry’s Jill St. John here. Day 1, On Monday the 1st of October they will leave the Croi headquarters in Galway at 9am, and over the next twelve hours they will visit the counties in the west, northwest and north of Ireland before stopping overnight in Armagh. 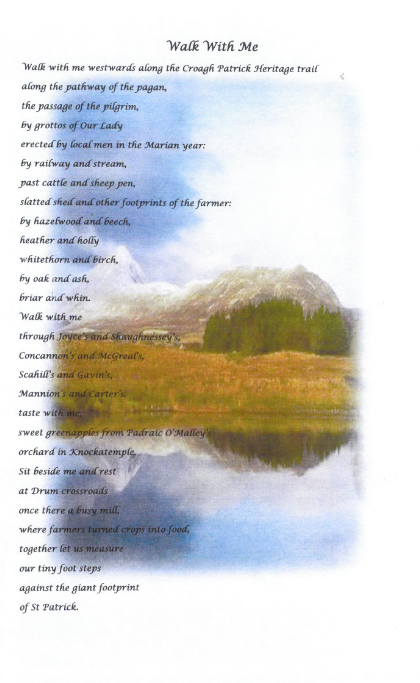 Day 2, Tuesday the 2nd of October is Martin’s birthday, and a 9am departure will see them head south along the east side of the county before the overnight stop in Cork, twelve hours after leaving Armagh. 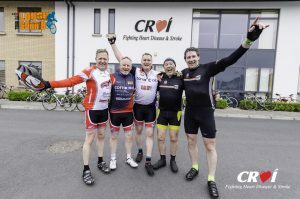 Day 3, the final leg, will see them leaving Cork at 9am and heading northwards through Kerry, Tipperary, Clare and back in Galway for a 5pm finish at the Croi headquarters, after a total of 32 hours of driving time over three days. Martin and Linda would love to meet other car enthusiast and/or clubs along the way, and they invite you to meet up with them for a photo at the main road sign as they enter each of the county towns or cities. Alternatively you can meet them at their planned stop offs along the journey, with the itinerary for each day being posted on their Facebook Fundraising page, 32forCroí. Here you can track their progress as well as donate to the charity. 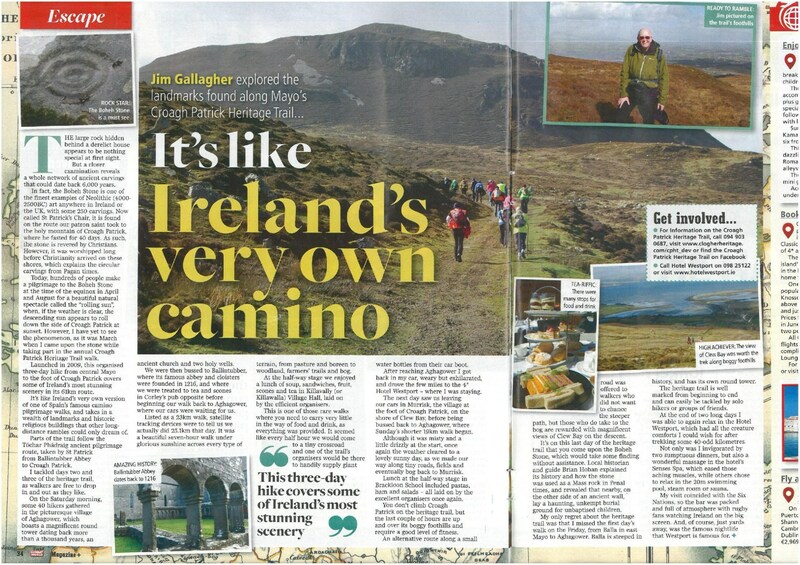 We would ask as many of our readers as possible to support Martin, Linda and this great cause somewhere along the route if you can, and to share your photos with us! 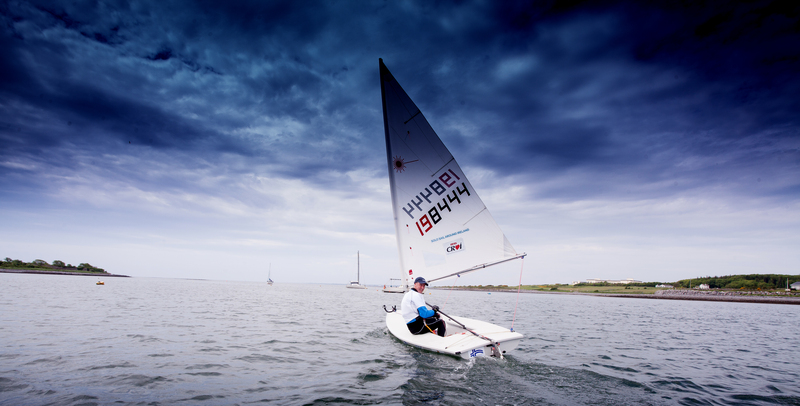 The Solo Sail Ireland Challenge. One tiny boat, one massive trip… for Croí! 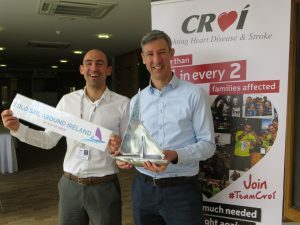 Ri chard Hayes sailed in one of the smallest boats around Ireland to raise funds for Croí. The laser dinghy weighed less than 60kg and is about twice the length of a kitchen table! Check out this great video on the trip. Richard arrived back into Galway Bay Sailing Club on Friday 14th September. He finally made his way back after 54 days out on the water, and close to 1,600 miles. Richard has become the first person ever to sail around Ireland in a tiny laser dingey, with no water support team what so ever!! 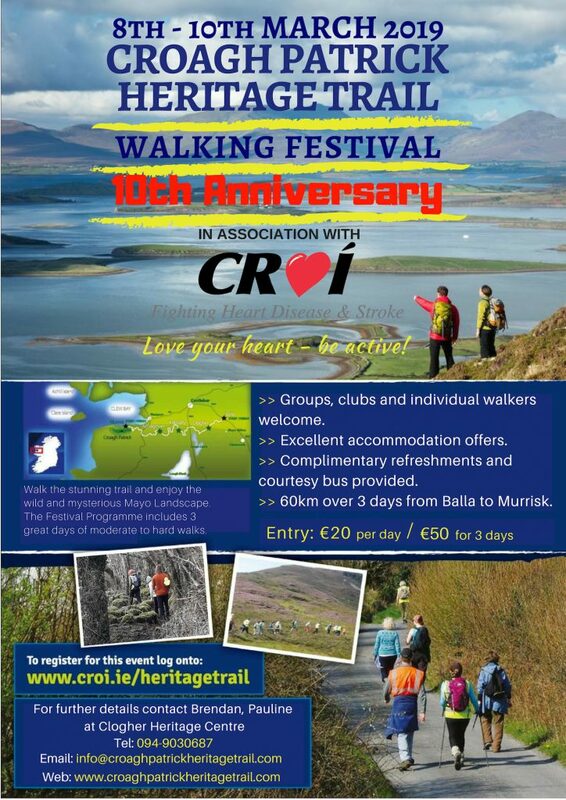 All to support Croí and part fund defibrillators across communities in Ireland. Hear Richard chatting to Patricia Messinger from Cork’s, C103 as he swings around the west of the rebel county, down in Skibbereen heading for the final 1/3 of this epic journey! “Raw footage from day 37 of the Solo Sail Ireland, as Richard passes hook head.. thankfully now passing Cahersiveen, Co. Cork. Onwards and upwards, homeward bound!” Richard explains the inspiration behind taking on this epic challenge, spending over 50 days out on the water alone!! 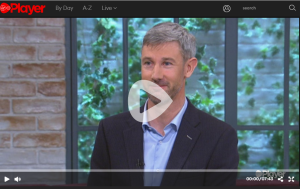 You can hear Richard below, talking to Keith Finnegan on Galway Bay FM, explaining what an epic challenge he is undertaking, and why. Interview starts 1 hour 12 minutes. This challenge started on Sunday May 27th, and the picture above captures the moment Richard set off from Galway Bay Sailing Club, Renville, Oranmore. Richard is aiming to return here in approx 8-9 weeks, weather dependent. 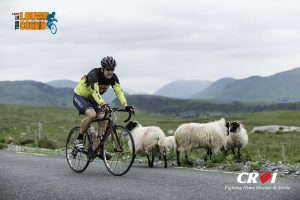 Richard will take on around 40 legs in order to complete the 1500km circumnavigation, and you can see up close footage of Richard tackling one of these legs in the video below. 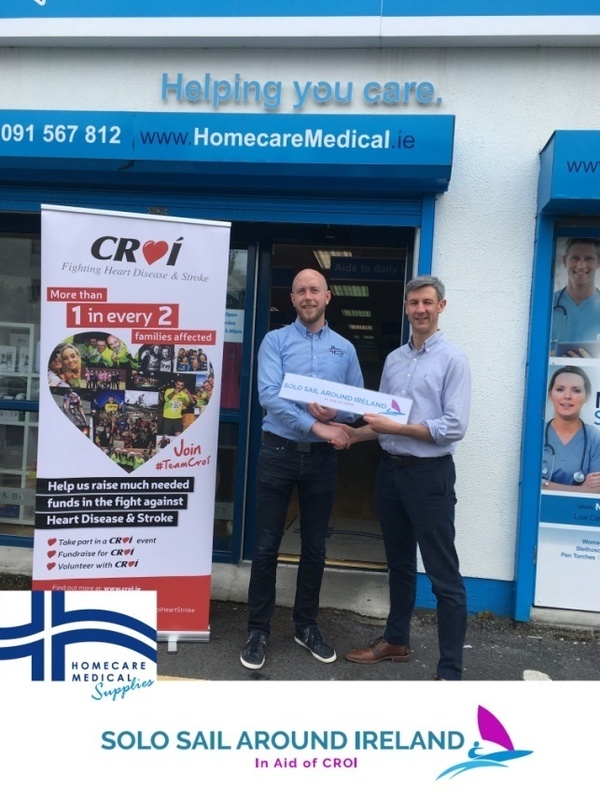 The challenge was made possible thanks to the support Richard received from main event sponsor, Homecare Medical Supplies, and many other local businesses. This generous support has enabled Michael, Richard’s father, to provide land support, and the only element of support for the duration of this challenge. 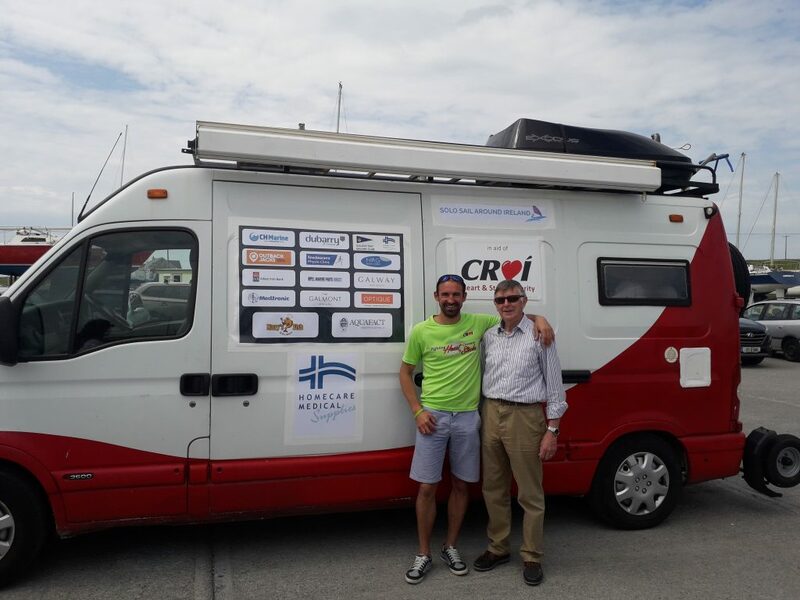 Richard spoke to Tommy Marren recently on Midwest Radio on how the challenge is going, what it’s been like sailing completely solo out on the ocean everyday, and how the land support camper van is fairing as overnight accommodation. Interview starts 40 minutes. 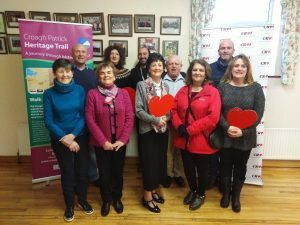 Cardiovascular disease remains the No.1 killer in Ireland, with Richard’s family unfortunately experiencing the loss of a loved one, but it can be largely prevented. 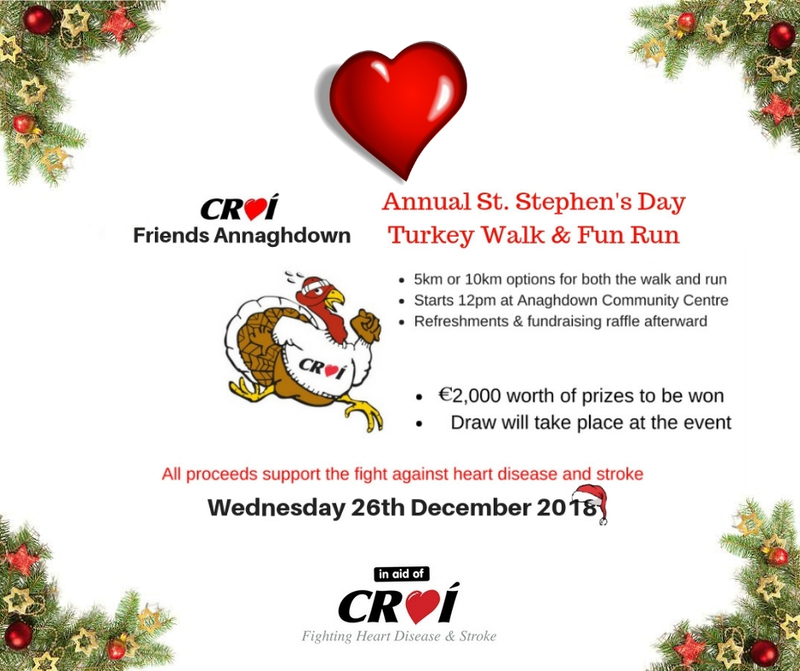 Money raised will help part-fund defibrillators for areas most needed across communities in Ireland, while also helping Croí continue the fight against heart disease and stroke. 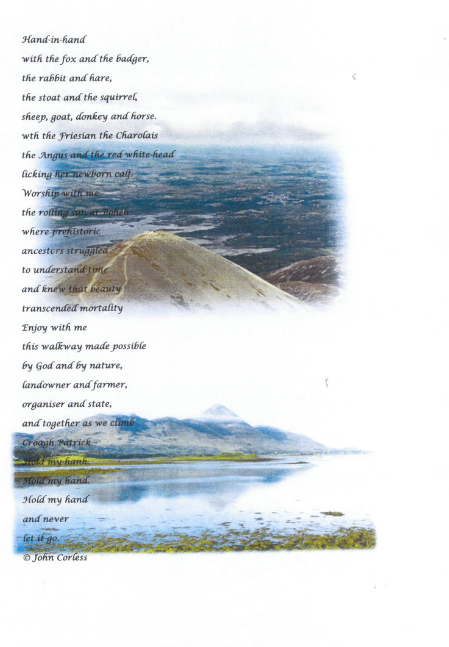 Richard would greatly appreciate your support, whether you would like to make a donation, or assist with the land or water support, your support can make a real difference. Contact solosailireland@gmail.com to get involved, and help save lives in your community. 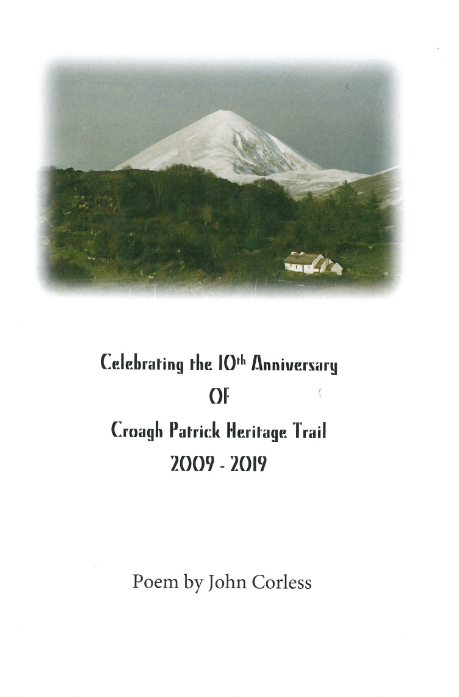 I understand that Croagh Patrick Heritage Trail and its associated representatives are not responsible for any harm, loss or damage caused to any walker, event attendee or to their property or equipment while attending or participating in the Croagh Patrick Heritage Trail Walking Festival 2019 or any of its associated activities. Frequent updates on this and similar events are being posted on the Event Facebook Page. As this is generally a moderate walk, a reasonable level of fitness is required. Proper walking boots and waterproof rain-gear is essential. Day two would be regarded as being the most difficult. Refreshments are provided at the start, middle and finish of each day. Note: Teenagers under 16 years of age must be accompanied by an adult. 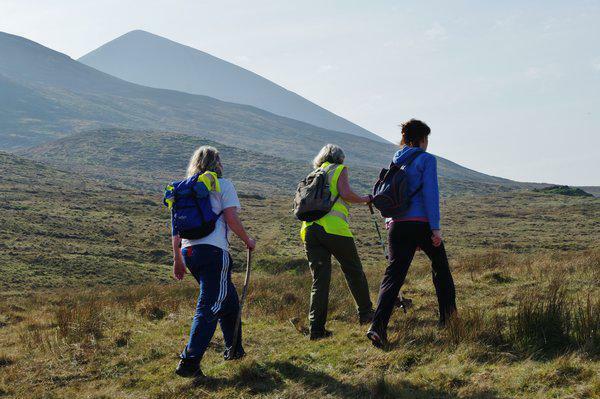 No Dogs Allowed on the Croagh Patrick Heritage Trail. Refreshment stop – Clogher Community Centre – Tea/coffee and sandwiches provided.